Juliet has always been an active part of the translation community and enjoys peer-to-peer knowledge sharing. She mentors novice translators and regularly meets fellow translators on-line, at conferences and at events organised by EU institutions and professional bodies. 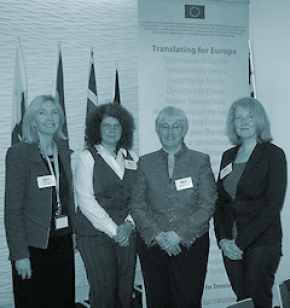 Juliet ran the Institute of Translation and Interpreting Italian Network on a voluntary basis for 20 years. During that time, she set up two websites and a newsgroup and also organised countless professional and social events. Her work as a lecturer and external examiner has brought her into contact with many translation MA students. Over the years, she has taken on a few students as paid short-term interns, which has proved an invaluable start to their careers. She has provided helpful advice and support to many others. As well as teaching on the translation MA at Surrey University, Juliet has also given talks on life as a freelance translator at the Universities of Surrey and Swansea. She has attended seminars at the European Commission DG Translation in Brussels and at the Translation Centre for the Bodies of the European Union in Luxembourg. She has also given a talk on her experiences as a contractor for the European Commission at the EU Commission Representative Office in London. Since moving to Cardiff, she has become part of the Welsh capital’s vibrant, active and cohesive translation community. Cardiff translators meet on a weekly basis to cowork and Juliet’s latest venture is offering co-working retreats at her two houses in Italy. In 2017, Juliet delivered a workshop entitled “Beat the agencies at their own game, develop a watertight workflow process” in Barcelona, Spain and Brescia, Italy for Mediterranean Editors and Translators, a knowledge-sharing and peer-teaching network for editors and translators.